Nourish young faith with a variety of children's songs based on prayers from all over the world! For many years now, children's composer Jack Miffleton has been a good and generous friend to young people in the Church and in Catholic schools. With The Gift of Our Friends, he offers 20 joyful and eclectic songs to nourish a child's budding faith. The collection covers every season of the liturgical year, as well as First Communion and other occasions throughout the school year. The songs support prayer, liturgy, faith formation classes, and assemblies -- any time children gather to sing and pray. International in flavor, the collection includes songs based on children's prayers from Africa, England, Japan and Israel. Other songs feature Scripture-based texts, with themes ranging from Mary and angels to creation and the care of animals. Conscious of the changing needs behind each developmental stage, Jack has written repetitive, playful songs for very young children and more challenging, traditional songs for early adolescents. Highlights include a sung meal blessing for each season of the year, "Jambo, Yesu!," a call-and-response based on an African prayer, and "Hurt No Living Thing," based on a poem by Christina Rossetti. Filled with imagery that invites friendship with Christ, The Gift of Our Friends is another gift from Jack Miffleton to teachers, music directors, and the young people they serve. 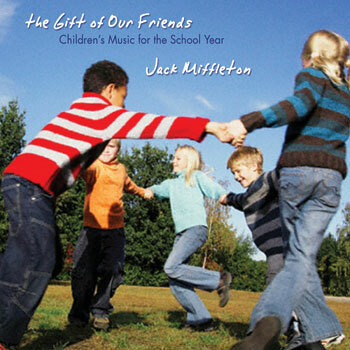 This 20-song MP3 album by Jack Miffleton features music based on children's prayers from Africa, England, Japan and Israel for every season of the liturgical year as well as First Communion and other occasions throughout the school year. This playlist also includes instrumental versions of each song on the album. For many years now, children's composer Jack Miffleton has been a good and generous friend to young people in the Church and in Catholic schools. With The Gift of Our Friends, he offers 20 joyful and eclectic new songs to nourish a childs budding faith. With songs for the entire liturgical year, school year and devotional milestones like first Communion, this collection from Jack Miffleton delivers a collection of songs dedicated to helping young souls take those important early steps in their walk with Christ. These songs are a gift to all who minister to children and will prove valuable for prayer, faith formation classes, youth liturgy, assemblies or really any time children gather to sing and pray. Reflective of the different developmental stages in a child’s life, this collection of songs includes simple, repetitive, playful songs for younger audiences as well as more traditional, challenging songs for early adolescents. Influences include children’s prayers from Africa, England, Japan and Israel, while several songs also feature Scripture-based texts. Highlights include “Jambo, Yesu!,” a call and response-type song based on an African prayer; sung meal blessings for every season of the year and “Hurt No Living Thing,” which is based on a poem by the great English poet Christina Rossetti.